OpenText announced a new release of Everywhere last week at Content World. And since there was a lot of buzz about a lot of things at Content World, I want to add a few thoughts and comments about this mobility announcement. No, I won't talk about the usual features and benefits of mobile applications. Instead, I took a look under the hood of the product. This is the second product release of OpenText Everywhere. Its primary focus is on expanding the capabilities that expose the functionality of the underlying ECM Suite with focus on process automation, social interactions, and content access. 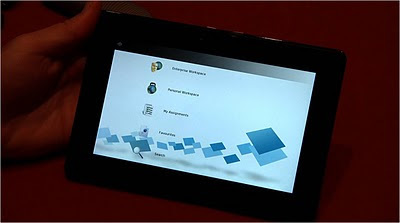 It is also adding support for Apple’s iPhone and iPad devices, alongside the previously provided support for RIM’s BlackBerry. And in his keynote, OpenText’s CTO Eugene Roman demonstrated an early version of OpenText Everywhere running on RIM’s PlayBook. That was apparently the first time the PlayBook has been shown outside of keynotes delivered by a RIM executive. Yes, OpenText and RIM are both headquartered in Waterloo and so there is an obvious connection there. (Note: The support for Playbook has not been formally announced yet but rather eluded to in a fairly public forum). - Bandwidth-Management: Managing bandwidth utilization is critical and not just because of performance. Bandwidth on a mobile device costs money. And when you are on international roaming, it costs a lot of money. To avoid spiraling communication costs, the mobile applications has to be designed as much less “chatty” – something that is often not a big concern for desktop applications. When accessing a 20 MB PowerPoint presentation, you don’t really want the file downloaded to your iPhone – the roaming charges could be excessive. OpenText Everywhere solves it by converting the presentation on the server-side into a set of images rendered on the fly. OpenText owns this rendition technology since the 2008 acquisition of Spicer and this technology is now embedded into the OpenText Everywhere application. - Connectivity: Many of my iPad applications are useless if I don’t have any connection. All I get is an error message which might be OK for a free consumer application but an enterprise application needs to be productive even if when I am on a plane with no connectivity at all. OpenText Everywhere makes this possible to work offline and it queues up my activities for when I reconnect. In addition, Everywhere allows to be configured to work over Wi-Fi or 3G to better manage my connectivity. - Security: Security is paramount for enterprise applications and it is a major concern for mobile devices accessing your confidential data. Today, IT has to support a multitude of devices with different security capabilities while some are corporate while others are employee owned. OpenText Everywhere leverages the existing security infrastructure of the device for encryption and the ability to wipe clean a lost device. This is much easier with BlackBerry than with other devices but that will be the topic of a future blog post. OpenText Everywhere has been also designed to support existing security policies such as use of a directory-based authentication and the leverage of the highly secure and compliant infrastructure provided by the ECM Suite. - Usability: A mobile enterprise application cannot be just a scaled down version of a desktop application. To gain user acceptance, the applications need to be designed specifically for the mobile device and ideally leverage functionality of the application the employees use regularly. That means it must not attempt to squeeze the same amount of information and the same number of buttons on each screen. To do this, OpenText Everywhere has been designed with the device in mind and it takes advantage of the unique facilities of each device (e.g. touch screen vs keyboard) and push notifications – again, these concepts don’t really exist on the desktop. As a result, for example the Everywhere screens for search results and ‘my assignments’ list look and behave differently than on desktop – they are optimized for the task at hand and for the device. I see more and more of my co-workers using mobile devices as their default tool. While mobile enterprise applications are still in their infancy, I expect that the mobile interface will be the default user interface in the not too distant future.